In Part I of this series, we examined the impact that SEO has on web performance. In this article, we analyze the performance impact of SEO within China and from the perspective of mobile sites. The pitfalls of responsive web design and/or mobile site configurations are well documented. Broken webpages, pages that aren’t optimized for mobile networks, duplicate content, troublesome transitions from larger displays to mobile screens, and device compatibility issues all lead to a poor end-user experience. Bad experiences lead to negative business outcomes such as higher bounce and abandonment rates. Once you’ve identified your target devices, you can continuously monitor your website’s structure and its rendering on a wide range of devices using a combination of custom viewport settings and using the right user agent strings. As a crucial aspect in your mobile-first strategy, it becomes imperative to monitor your site performance from mobile networks (not just monitoring mobile page on Wi-Fi). Optimize content to ensure there is minimal overhead on network usage as well as resource usage on portable devices. This includes optimizing images (compression based on user network), compressing text-based content, and various front-end optimization techniques (minification, whitespace removal). 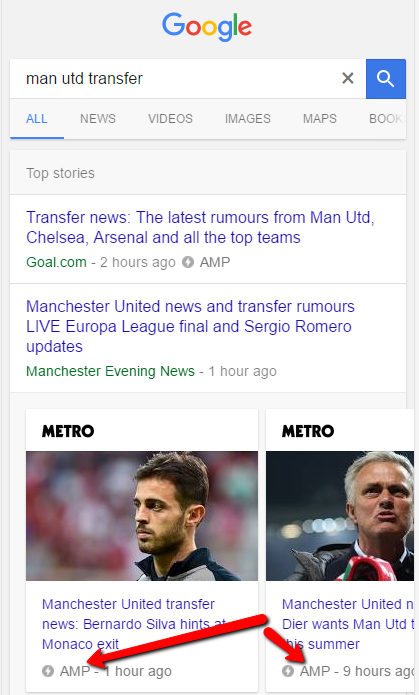 Accelerated Mobile Pages (AMP) is Google’s open source initiative to make high-performing webpages (for mobile users). AMP pages are built using three core components, an AMP HTML, an AMP JS library for fast rendering and an AMP cache, for delivering all AMP documents cached. Facebook’s Instant Article (FIA) is an HTML5 document that loads very quickly in mobile Facebook. FIAs promise a ten times faster load times than standard mobile web articles, 70% less likely on article abandonment, and 20% more reads. The end goal of both AMP and FIA is a faster loading mobile page. Implementing them requires time and effort to redesign, adhering to the guidelines, and due consideration to publishers’ will. But what they do provide is a boost to your SEO strategy and website performance, hence worth investigating further. As with most internet trends, SEO in China comes with its own set of exceptions and baggage. With over 50% of its 1.37 billion population having access to the internet, China represents a big demographic for any business to target. The annual Chinese Singles’ Day sale trumping the Black Friday sales by over five times, China also represents a very affluent demographic. With over 75% of market share, Baidu is the leading search provider. Optimizing your SEO strategy to cater to Baidu’s requirements would make for a smart beginning. Website load time remains as pertinent as elsewhere. But maintaining great webpage load times requires effort and possibly Great Wall-esque amounts paper work and regulatory compliance. Why? One of the biggest challenges in providing a consistent, fast website for Chinese end-users, is the great Firewall of China. The Chinese government’s instrument in regulating the internet domestically, its used to block certain websites, filter out key words from search results and in effect slowing down cross-border internet traffic. Overcoming this requires, the content be hosted within China, served from PoPs of CDNs within mainland China. And to do that, the government mandates that companies obtain their ICP (Internet Content Provider) license. Obtaining the ICP license and effectively serving content from within the country boosts your webpage’s rankings in Baidu’s SRPs. A “.cn” country domain hasn’t known to provide a big boost for your SEO, but does help Baidu know you’re focused on the Chinese market specifically. Constantly audit your website for objectionable content. That includes anti-government expressions, politically sensitive argument, images that depict any of the above also can cause your website to be taken down. [No Website, what SEO?] Outbound links to Google, Twitter, Facebook and other banned websites lead to a penalty. Track and be alerted if the above make their way on to your webpage. Other best practices include avoiding serving contents from multiple sub-domains, avoiding Flash content, JS based redirections. Proclivity towards URLs containing Pinyin and content mostly in Simplified Chinese is known to be beneficial. Download our ebook China: Setting Up a Web Presence in The World’s Most Populous Nation to learn more about tuning your web performance in China. With over 95% of the internet being accessed by mobile devices in China, it’s imperative to focus on optimizing your China web presence for Baidu’s Mobile SEO considerations. Unlike the recommendations from Google for maintaining a responsive website for mobile users, Baidu recommends separating out both your desktop and mobile versions. Using an “m.” site is known to have been the preferred option. Mobile Instant Page (MIP), Baidu’s answer to AMP with an architecture similar to AMP, an accelerated JS, HTML and a caching system, has already known to reduce page times by up to 80 percent. There has been no confirmation yet if MIP pages would get special real estate on the SRP (like the AMP), but implementing MIP improves your SEO rankings by simply making your website faster. The post Web Performance Monitoring and Its Effect on SEO Pt.II appeared first on Catchpoint's Blog - Web Performance Monitoring.